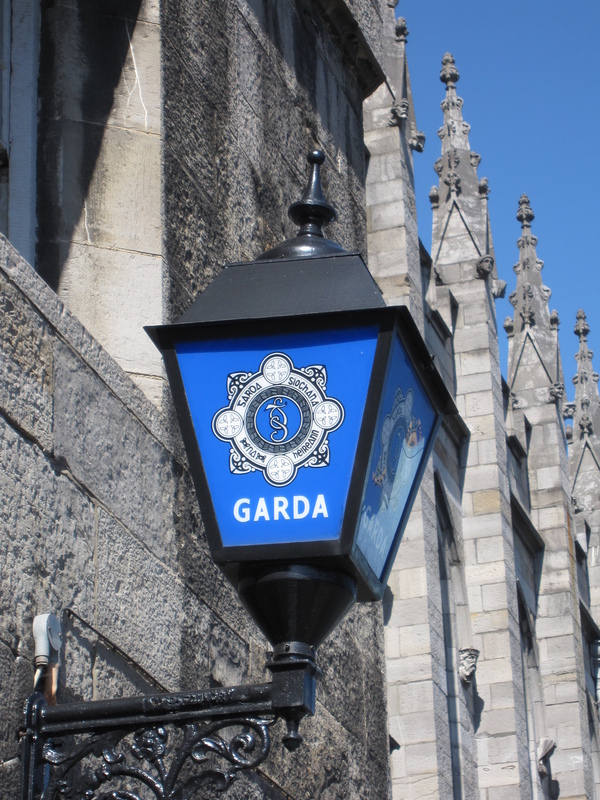 Interesource Group is delighted to have collaborated with An Garda Síochána in partnership with the Centre for Deaf Studies, Trinity College Dublin and Sign Language Interpreting Service (SLIS) has developed a Pilot initiative to support members of the Deaf community attending Cabra and Tralee Garda stations. The scheme was launched on 1st March 2019. It is difficult to believe that in 1988, Irish MEP Eileen Lemass presented a resolution on sign languages which was unanimously passed in the European parliament recognising the sign languages of member states as official languages. Consecutive Irish Governments had ignored (until today that is) the plight of the Irish Deaf community and need to recognise Irish Sign Language despite many countries affording it the status it truly deserves. Without legal protections Deaf people face uncertain and limited access to society. From access to education and healthcare, to interpreting standards and television programming, legal recognition will go a long way towards removing barriers that exclude Deaf people on a day-to-day basis. Irish Sign Language has become a keystone for achieving Equality for Deaf people, without which places Deaf people at social, economic, and cultural disadvantage. But today is not a day to speak or sign in a negative light. A gigantic leap has been made. 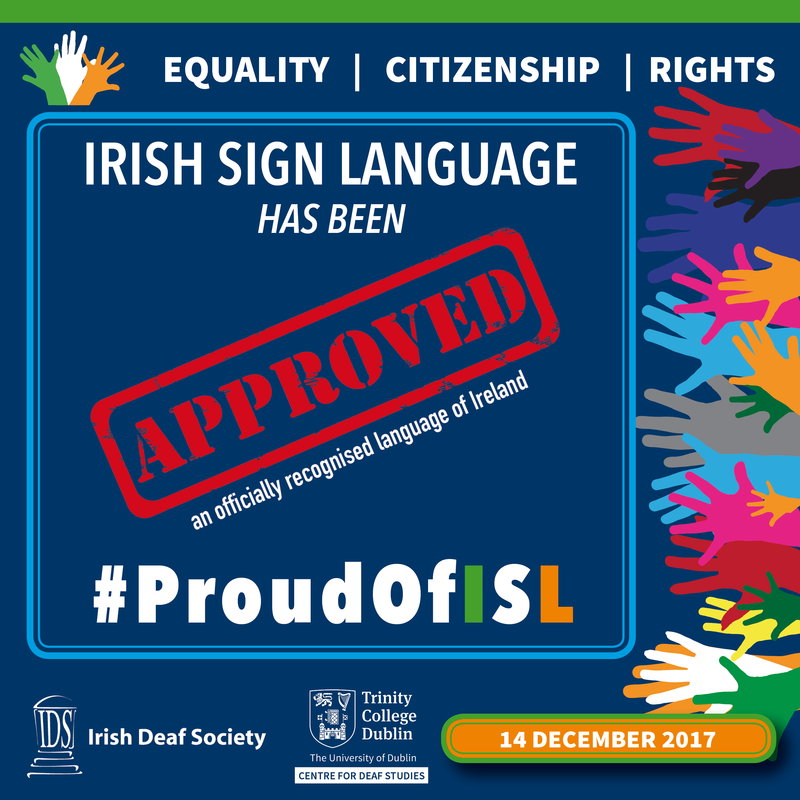 The Deaf and Irish Sign Language community has received an early Christmas present as the Irish Government has just passed The Irish Sign Language Bill, presented by Senator Mark Daly, in Dáil Eireann. Another page in Irish history and culture has been written. In this very short announcement, we are proud to be associated with the Deaf community in which we work and live, and offer our heartiest congratulations to the Irish Deaf Society, the Irish Sign Language Recognition Committee and its Chair Dr. John Bosco Conama from the Centre for Deaf Studies, Trinity College Dublin and of course the Irish Deaf and Sign Language Community who have worked tirelessly to make this day happen. It is through awareness that knowledge is acquired. It is through knowledge that attitudes shift. It is through attitudes that behaviour changes. The JUSTISIGNS project team, led by Interesource Group (Ireland) Limited, was one of five winners that was awarded the 2017 European Language Label for innovative ways of teaching and learning languages. The 2017 awards were presented by Dr. Gabriel Fitzpatrick, Chairman of the Board of Médicins San Frontières at Farmleigh on 29 September. Since 2013, the JUSTISIGNS team have been working to improve access to justice by providing training and continuous professional development to each of these interlocutor groups across the partner countries and beyond. Evidence-based research was conducted across Europe to establish the state of play of interpreter provision across the member states. In each country, extensive focus groups and consultation with key stakeholders informed the team about which types of training resources were needed. A series of toolkits and resources were created with targeted audiences in mind. These included an online three-way training programme; toolkits and guidebooks for the police; and posters and the delivery of expert masterclasses across the partner countries. Although the project concluded in 2016, the team continues to offer training in Europe (e.g. the Balkan states), Australia and New Zealand. We wasted no time in the new year and launched our brand new education and training project called DESIGNS. 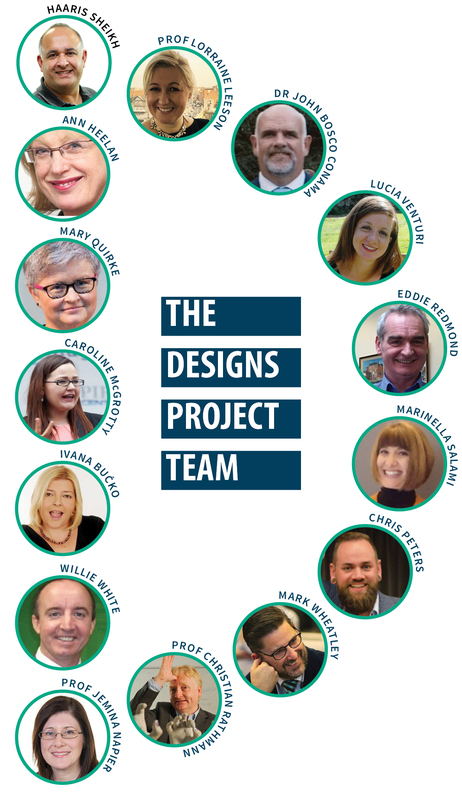 The DESIGNS project brings together partners from 4 EU countries who are renowned experts in the fields of Employment, Education and Training, Sign Language Interpreting and Training, and Deaf community advocacy. The overall aim of the project is to create VET and CPD training resources and exchange best practices across Europe to facilitate greater participation of Deaf sign language users in employment. Centre for Translation & Interpreting Studies in Scotland (CTISS), Heriot-Watt University. The meeting of the international partners took place in Deaf Village Ireland in January, followed by the first in a series of Town Hall sessions, which was streamed and watched live by 8,000 viewers and with an additional 11,000 viewers watching the session after the event on Facebook. The event – with 11 speakers, generated much international interest from around the globe, and the session ended with an exciting questions and answers session moderated by the Irish Deaf Society’s chairman, Eddie Redmond. Over the next 24 months some of the other results we now look forward to launching are a series of handbooks for the employers in all partner countries, a comprehensive online course, masterclasses for interpreters and the deaf community and a research documentary which features experiences of Deaf job seekers, policy makers and employers. efsli has been working on developing a template of a portfolio of competencies which SLIs can use to record their continuous professional development (CPD) activities, and we look forward to sharing this with you in the very near future. The Irish team will be on a diplomatic mission in May and will be sharing the DESIGNS vision and meeting consular officials of the Balkan states in Belgrade. It is difficult to believe that some thirty months ago our expert project team met to consider just how JUSTISIGNS would shape up and whether and what we do as a consortium could make a difference to the society in which we live and the communities that we serve. We have achieved so much in a relatively short period and there is much to be proud of. 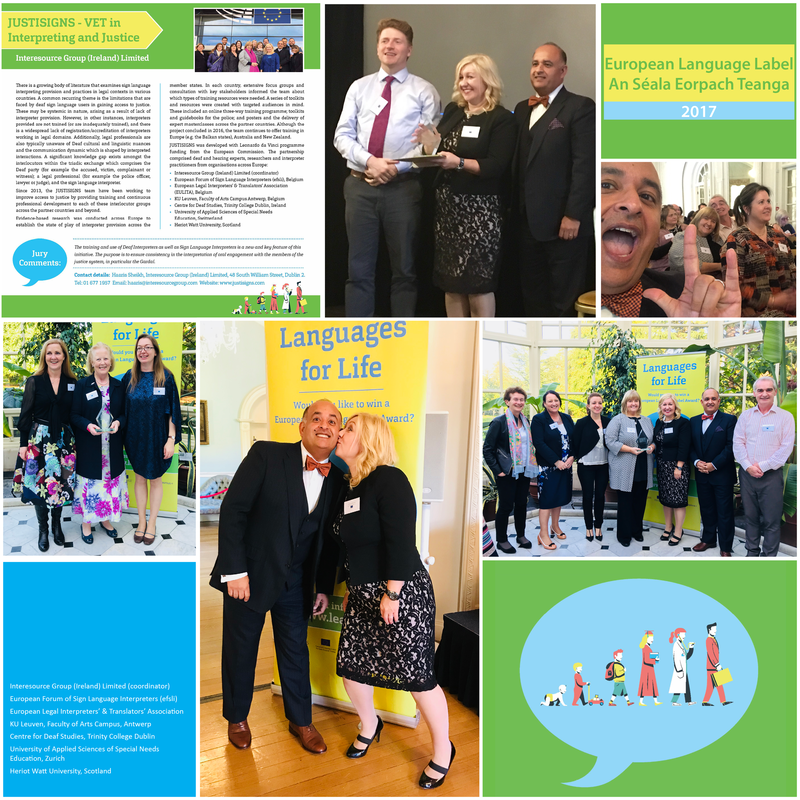 JUSTISIGNS has laid a solid foundation for the development of professional skills of sign language interpreters working in legal settings and achieved commendable results, which we recently presented alongside distinguished partners and panelists at the European Parliament on 27th April 2016. Engagement with our stakeholders has been wide, and profound. Contributions from the Deaf community, the interpreting professionals, the police forces and legal professionals from each partner countries has been significant. JUSTISIGNS has grown its own legs and we are confident that the resources that we have collectively produced will bring many benefits well beyond the life-cycle of the project and for many years to come. JUSTISIGNS represents a further step forward. Our academic partners created cutting-edge and innovative content. efsli and EULITA have engaged in extensive dissemination of information through their networks and social media channels. We also pay tribute to all the professionals who have been involved in developing the various project outputs. Expertise, professional knowledge and invaluable human resources have been the key to the success of JUSTISIGNS. We are grateful for every contribution – whether it was tweeting our results, participating at training events or providing us guidance and support. The commitment and capability of the project’s partners have contributed to JUSTISIGNS’ remarkable results. JUSTISIGNS has evolved through a series of events, seminars, workshops and evidence-based research which has guided the development of the training resources. In addition, we are continuing to work with our stakeholders to provide advice and training, we are planning to roll out the JUSTISIGNS course to new territories and we are achieving success in securing presentations at conferences throughout 2016 and 2017. Some of the other results we now look forward to launching are a series of handbooks for the police forces in all partner countries, a comprehensive online course for legal professionals, interpreters and the deaf community and a research documentary which features experiences of legal professionals, policy makers, educators and the Deaf community. efsli has been working on developing a template of a portfolio of competencies which SLIs can use to record their continuous professional development (CPD) activities, and we look forward to sharing this with you in the very near future. We hope you will enjoy this short video and find it inspiring with new food for thought for future achievements and ongoing collaboration with us. We’re 20 years in business today! Today, Interesource Group (Ireland) Limited celebrates 20 years in business. Our small company – with a few directors and many consultants and partners, set out to make a difference for our clients and customers. On 28th June 1996 the company was registered and started an international recruitment service provider for JI students travelling to the USA. Twenty years later, we remain a debt-free, small Irish business which has survived a turbulent economic period and we now specialise in 4 key areas: HR and Business Consulting; Publishing; Creative Media and Design, and Education and Training. 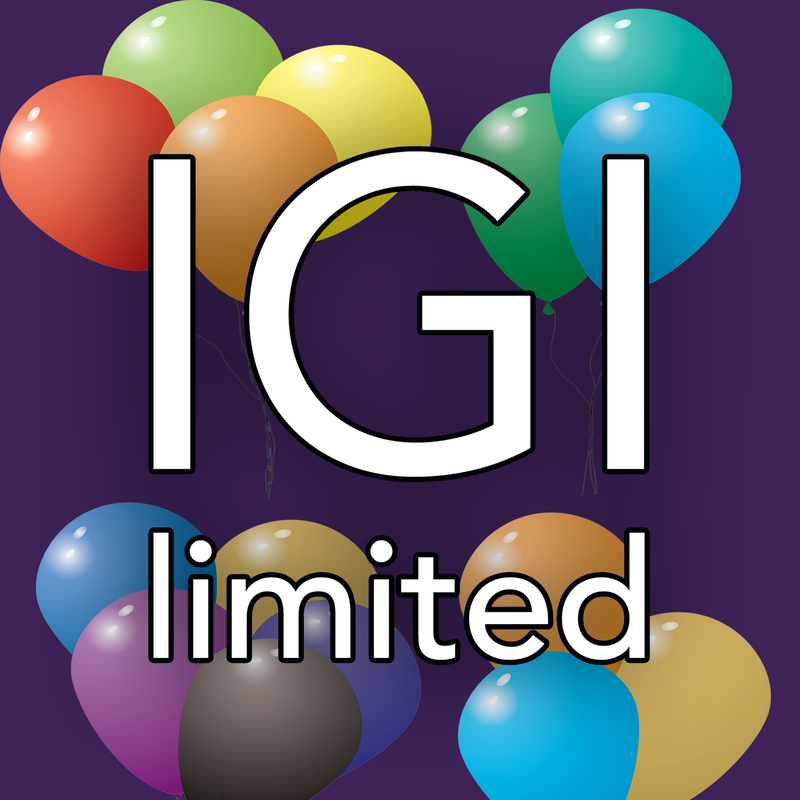 (IGI Consulting, IGI Publishing, IGI Media, IGI Education). We never set out to make millions. We set out to make a difference. We have had the privilege of working with global field experts from 22 countries and we have learned so much. We have had the pleasure of sponsoring and supporting great causes from disability charities, social clubs, local organisations and international projects that support education of disadvantaged societies. As we enter our 21st year in business, we will harness the experiences we have gained, coupled with the trust we have earned from our very loyal clients, colleagues and friends, and we commit to growing our business so that we can continue to innovate, meet newer challenges and make greater differences for the societies that we live and work in. I would like to thank every person, organisation and partner that has worked with us since we started. I hope we have always met your expectation and I look forward to building on the wonderful relationships and friendships for the next 20 years. 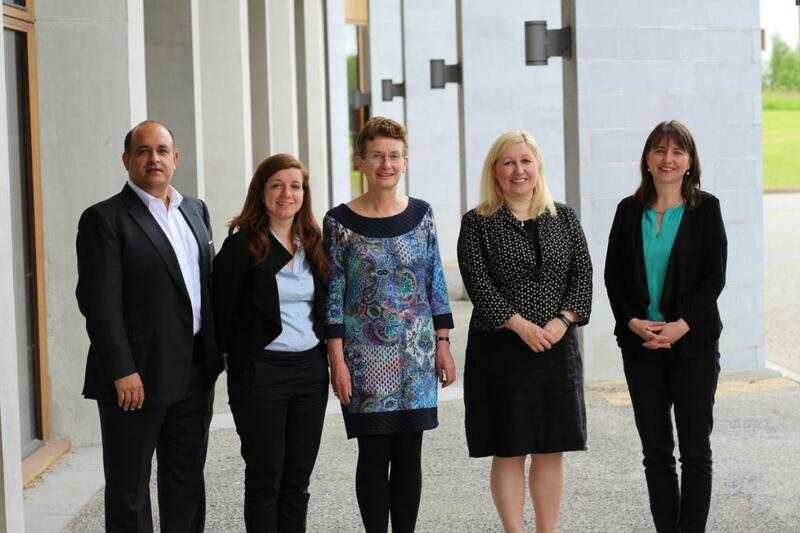 Attending the 5th Community Interpreting Conference are:(Left-Right) Mr.Haaris Sheikh (Justisigns Project Chair/CEO Interesource Group), Ms.Lucia Venturi (TCD), Dr.Mary Phelan (DCU), Professor Lorraine Leeson (TCD) & Professor Anne MacFarlane (UL). The 5th Community Interpreting Conference was hosted by UL in the Graduate Entry Medical School on May 20th. The event was well attended with presentations from colleagues from Dublin City University, Trinity College Dublin, University College Cork, the HSE and the Garda Racial, Intercultural and Diversity Office (GRIDO). An annual event, the conference is designed to bring together academics, researchers and service providers to share their work in the area of community interpreting. The JUSTISIGNS team discussed the results of the international survey and also some of the strategies and solutions for interpreters and the legal professionals when interacting with Deaf sign language users. While the centenary commemoration of the 1916 Proclamation was marked on Easter Monday 28th March this year, the actual reading of the 1916 Proclamation was on 24th April 1916, shortly after noon. Today is a day to be celebrated in Ireland. The Ireland 2016 Centenary Programme commissioned Interesource Group to produce the translated video to ensure that alongside the reading of the 1916 Proclamation which guarantees “equal rights and equal opportunities to all its citizens” that the Irish Sign Language using community would have full access to the 1916 Proclamation in their own language. This facilitates full participation of Deaf citizens on what will be an historic day. This is extremely important as Deaf citizens are continually excluded from daily participation in all walks of life, and this impinges on the opportunity to engage as full citizens. One of the reasons for this is the fact that ISL is not legally recognised or protected in Ireland as an official language of the State, a fact that increasingly marks us out from our European and International counterparts. New EU Regulations are to be introduced to simplify EU English as a cost-saving exercise across the main European institutions this year. This move comes about as proofreading and re-printing costs soar in the EU institutions, who insist on all formal documentation being made available in English, French and German. English is widely regarded to be one of the most difficult languages to master. Despite its widespread use as the lingua franca, both English-speakers and people learning English as a foreign language have complained (despite the availability of spell checks) about how hard it is to spell English worlds correctly. For the same reasons institutions such as the European Parliament have increasingly found that EU documentation have more grammatical errors as well as correspondence containing mixed appearances of European English, American English and British English, also known to many as Queens English. Research conducted by the AAA found that most people surveyed were in favour of simplifying English grammar by abolishing the terms “Queens English”, “British English” and “American English” and replacing these collective terms with just the term “English”. Keyboard manufacturers have cautiously welcomed the EU Directive as they feel that this will allow manufacturers such as Apple to continue to reduce the size of their keyboards. Interestingly research shows that keystroke software (which runs in the background of all computers automatically) analyses the keys that people use has reported that the exclamation mark and the apostrophe are the least used keys across all 27 member state’s in Europe!!! And while eradicating these keys from our keyboards won’t be anything we need to be worried about in the short-term – linguistics and purists fear that such drastic measures will ultimately result in the emergence of a variant of English that by 2060 will be unintelligible by today’s older generation. In 2018 we may see “two” “to” or “too” taking a new form. Or indeed, a pair of these may simply be made redundant leaving behind just a single “two”. Whether we’ll see the apostrophe being dropped all together in all English curricula from 2018 or whether the Queens English will be superseded by an Anglais Nouveau Européen remains to be seen. And, just as we familiarise ourselves with these changes to our language in 2018, don’t forget that in 2020 there will be an outright ban on the use of latinisms. Remember that circa 70% of you voted to abolish latinisms, abbreviations, along with a superfluous lists of other things that go on and on etc. etc. etc. If you want to maintain the status quo – take our poll below. 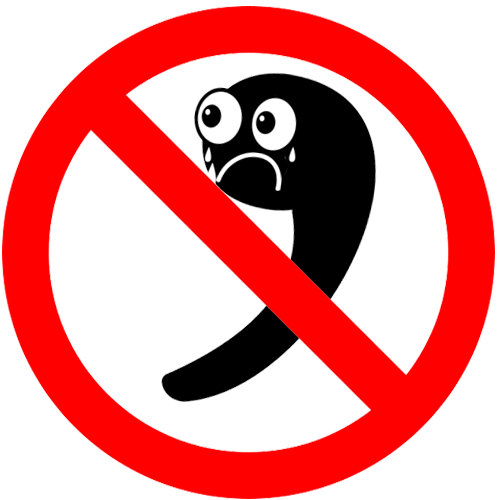 For further reading check out the Apostrophe Abolition Association link. The Irish Deaf Society, the Centre for Deaf Studies at Trinity College Dublin and Interesource Group (Ireland) Limited work closely on many educational projects and for the 1916 Proclamation Translation project, we convened a small team of translators and interpreters to work on the translation, filming and production of the text. Because Irish Sign Language has no written form, the digital version is a de facto translation: like written translations, it is highly prepared and each element is considered in terms of formality, context, meaning and political resonance. The visual quality of the translator signing has to be crisp and clear – to do otherwise renders the translation ‘inaudible’ for an audience for whom visual access is key. And access to this key historical text is the primary goal of this work. Today, the Provost of Trinity College Dublin, Professor Patrick Prendergast, launched a collection of 17 translations of the 1916 Proclamation in the languages taught at the College which includes Irish Sign Language. The translation of the Official 1916 Proclamation in ISL translation as seen here will also be available on websites across the country.